Review date: 11 June 1999. Lots of people are into 3D gaming, but it's not really 3D. Nothing looks as if you could reach out and grab it; it's just an image on a screen. If you've only had one eye for as long as you can remember, an image on a screen is pretty much as good, depth-wise, as anything you've ever seen, but those of us lucky enough to have the usual complement of optics would like our 3D games to live up to the name. ASUS' VR-100 looks, on the face of it, like just the ticket for actual honest-to-goodness 3D gaming on the cheap. They're a big, black, chunky - well, to be honest, dog-ugly - set of LCD shutter-glasses, with a cable that terminates in a plain stereo 1/8th inch headphone-type plug, although it has nothing to do with sound. The higher-specced versions of the ASUS V3800 TNT2 video card (reviewed here, along with two other TNT2s) have a socket for the VR-100's cable built in; the flagship "Deluxe" V3800s actually come with the glasses. If you've got the connector on your V3800, the specs-and-software VR-100G package will set you back a piddling $45 (Australian dollars). 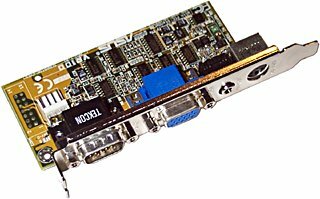 The lower-specification V3800s, and the earlier V-3400 TNT-1 board, need an extra adaptor board, which screws into a vacant expansion slot but doesn't actually plug into anything inside the PC except a power cable. The adaptor board attaches to the video card via a Voodoo-style passthrough cable. The glasses package with the board included retails for $69 Australian. At this kind of price, you'd have to say it's hard to go wrong. But, as I found out, it's possible. If your V3800 has a shutter-glasses socket, all you have to do is plug 'em in and install the software. If you're installing the adaptor board as well, you screw it in like any ordinary expansion card, over whatever slot you have free. Since it doesn't actually plug into a slot, it doesn't matter where it goes. Connect the supplied power cable to a spare plug inside the PC, hook up the video card's output to the adaptor board's input and the board's output to your monitor, install the software and you're away. Pop the rather uncomfortable glasses on your face, making yourself look like a low-budget cybernetic Buddy Holly, and 3D nirvana awaits! I've seen some dodgy driver software in my time, but ASUS' effort for the VR-100 isn't a release, it's an escapee. 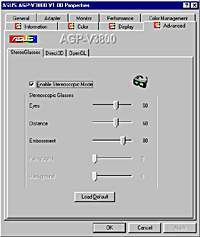 It adds a 3D setup panel to your Display Properties under Windows 95/98, but what the heck you're meant to do with the cryptically named "Eyes", "Distance" and "Embossment" sliders is hard to say. The manual devotes a total of one page to the 3D glasses, and tells you that Eyes is the distance between your eyes (in what units, they don't say), and Distance is the distance between the foreground and your eyes (perhaps the foreground is the front of the monitor, but the units are still a mystery), and Embossment is "the effect to make objects virtually pop out of the screen". Which they appear to think is self-explanatory. Furthermore, you need a monitor that can do at least 120Hz interlaced mode in 640 by 480. Interlaced mode is something that's, thankfully, practically unknown in current monitors (to see why it's necessary, check the How It Works sidebar), but many monitors still support it. It's perfectly possible that yours won't, though. And if you want to have 3D in OpenGL games - sorry. The VR-100 only does its thing with Direct3D. All of this means that setting up the glasses for any given game is an exercise in frustration. Assuming your monitor works with the VR-100 (which, to be fair, it probably does), some or all of your games are likely to be OpenGL-only, and therefore complete non-starters. For Direct3D games, you twiddle the utterly undescribed sliders, run your game, peer at the screen, quit out, change the settings again, run the game again, lather, rinse and repeat. The manual doesn't tell you what to do, the effects of your changes are hard to see, there's no way to save the settings that work for a particular game, and, as if that's not enough, the software is rather unstable and crashes regularly. Of course, running and quitting and running and quitting system-hog 3D games isn't the greatest recipe for Windows box stability at the best of times. The correct slider settings for different games may vary widely, but there's no way to automatically change the settings to match the game you're running, because, as mentioned above, you can't even save settings and select them manually. Let's assume you do manage to get the settings right, and nothing crashes. Even then, you'll be irked to see that each eye actually gets to see both eyes' images; the one it's not supposed to see is just a lot dimmer. I'm not sure why this happens, but it happened with the first pair of glasses I got to briefly try, and also with the pair included with a V3800 TVR Deluxe card which I got to review for longer. When I held the glasses up to a mirror and looked through one lens, I shouldn't have been able to see anything through the other lens reflected in the mirror, since whenever the lens I was looking through was clear, the other one should have been opaque. But, instead, the other lens seemed only as opaque as dark sunglasses - objects were dimly visible through it. Perhaps one lens is still clear when the other one turns clear, giving a brief both-eyes-open period. Perhaps the shutter glasses just aren't properly opaque when they're supposed to be. Either way, it's a real pain. All of your supposedly 3D objects will have a ghost image on either side, the result of each eye seeing a dim version of what the other eye only is supposed to be shown. Perhaps the two pairs of glasses I checked out were both lemons. But if they're all like this, then frankly, it stinks. All of this pain pretty much cancels out the joy of such a cheap 3D solution. If you paid hundreds and hundreds of dollars for the VR-100 setup you'd be justified in marching on the ASUS headquarters with torches and pitchforks, demanding the head of the people responsible. As it stands, most buyers will probably just shrug and figure that you get what you pay for. But it doesn't have to be quite this bad. The ghosting problem causes half of the pain, but the rest is the fault of the awful software, which I can only presume was created by putting a lot of bits in a jar and shaking until an executable fell out. A proper driver, with proper documentation, could go a long way to making this a worthwhile toy, when you consider the rock-bottom price. All whingeing aside, what's the 3D effect like? Well, thanks to the ghosting problem of the specs I tried, it's lousy. Everything's double-imaged and totally cheesy. If you look past the ghosting - which is impossible for me to do, but let's assume you're less picky, or get a set of glasses that actually works properly - then the 3D effect is still pretty underwhelming. Yes, things look solid - the monitor glass seems to be a window, not a TV screen, and it looks as if you could reach in and grab objects. But you can't lean to one side to see around something. That sort of proper interaction is the preserve of much more expensive head mounted displays with motion tracking. Embossment or no embossment, nothing leaps out and grabs you by the nose. It's certainly more 3D than the standard, no-glasses kind of 3D gaming. Without the ghosting, and without the awful setup nonsense, it'd be pretty cool, and great value for money. But with the crap you have to go through, and with the ghosting, it is as far as I'm concerned a complete waste of time. If you're a tinkerer with sufficient spare dollars in your pocket, and the idea of more realistic 3D really turns your crank, you could do worse than buy the VR-100 kit. It sort-of, kind-of does the job, and it is cheap. If you're considering a V3800 or V3400 over a competing card because of the VR-100 option, though, think again; it ain't worth it, right now. Presumably ASUS will get their act together and write proper software and docs for the glasses some time soon, which will make them at least decent value for money even if the setup process still requires a fair amount of tinkering. If you have faith, go ahead and buy the specs now, in expectation of Software From Heaven. If I were you, though, I'd hang around and see if ASUS choose to turn this fatally flawed product into something worth buying. 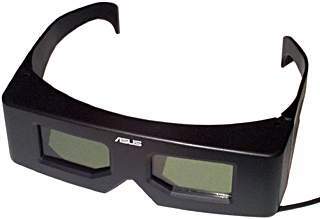 Cheap 3D glasses like the VR100 set do their magic by means of LCD (Liquid Crystal Display) shutters, which let only one eye see your monitor at a time, and flicker very rapidly so you get the illusion of a continuous image. The liquid crystals sandwiched in the panels polarise the light that passes through them when a voltage is applied to them. Put an opposing polariser over the top of the liquid crystal, and no light can pass when it's energised. Try looking at an LCD with polarised sunglasses on; at two angles, the display will appear black. You can also, incidentally, take some kinds of LCD apart, remove the polariser and turn it around, giving you a white-on-black display instead of the usual black-on-white. Shutter-glasses are so cheap because all the shutters do is block vision for one eye, then the other; they have no display abilities of their own. The displaying is done by a regular monitor. The glasses synchronise to the monitor's screen refresh rate, so each eye is uncovered when the monitor's showing the image that eye should see. The way the VR100 makes sure each eye has the right image presented to it is by putting the monitor in interlaced mode, where each sweep of the electron beam over the screen draws only every second line. Interlace is a quick and dirty way of reducing overall flicker, which is why it's used by ordinary television, but current monitors and video cards don't use it, and for good reason. When you paint only every second line, and fill in the blanks on the next scan, high-contrast horizontal lines flicker. Since computer screens, unlike TV images, are often full of high-contrast horizontal lines, interlaced mode is a pain. Many older computer how-tos warn you to make sure that any monitor you're considering buying can do the resolution and refresh rate you want without using interlace; today, you can safely assume that it can. The minimum requirement of the VR-100, for 120Hz interlaced mode in 640 by 480, is not actually as demanding as it sounds. Because it only paints half of the screen at a time, interlace inherently halves the bandwidth demands of displaying at a given refresh rate, and any monitor that can do 60Hz at 640 by 480 (in other words, just about any monitor that works with a current PC) has as much screen-painting power as it needs for 120Hz interlace. That doesn't mean it can actually do interlace, though. Interlace is a totally undesirable feature for plain displays, so monitor manufacturers don't feel much urge to include it. Why use interlace? To get a reasonable refresh rate. Since each eye only sees half of the monitor refreshes when you're using shutter-glasses, the effective refresh rate is divided by two. Without interlace, this would make your rock-solid 85Hz into a migraine-inducing 42.5Hz. Interlace means you lose half of your vertical resolution, but you get double the refresh rate in return. 60Hz is a bit flickery, but not too bad. The VR-100 supports interlaced refresh rates of up to 150Hz, as long as your monitor does; this gives an effective 3D refresh rate of a perfectly acceptable 75Hz. The generally accepted point where flicker stops being noticeable is around 72Hz.